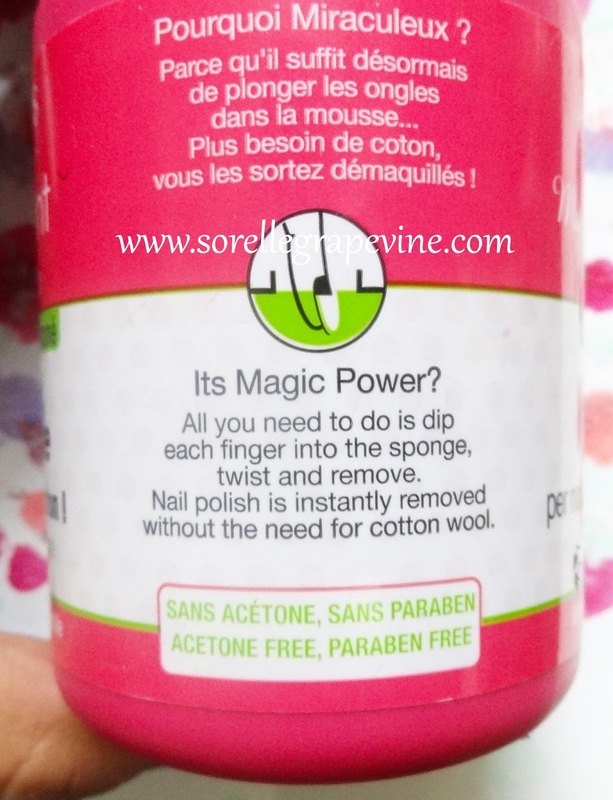 Ever since I saw a few reviews on Boujois Magic Nail Polish remover have been itching to try it. As a concept I found it very convenient albeit sort of unhygienic so to speak. But my main motive of procuring it was in hopes it would replace the whole nail foil removal method that I have to do when I don glitter paints. It takes some work and honestly I’m not the kind of person to have patience for a mundane task like that but the alternative is equally appalling! So in hopes that it would do the same thing for me ie I could keep my nail encased in the sponge for sometime and voila I would be glitter (paint) free I paid 800 bucks for this thing. I will talk about how it fared later in the post. Let me start off by illustrating the product details for you. It comes in a bright pink plastic jar. 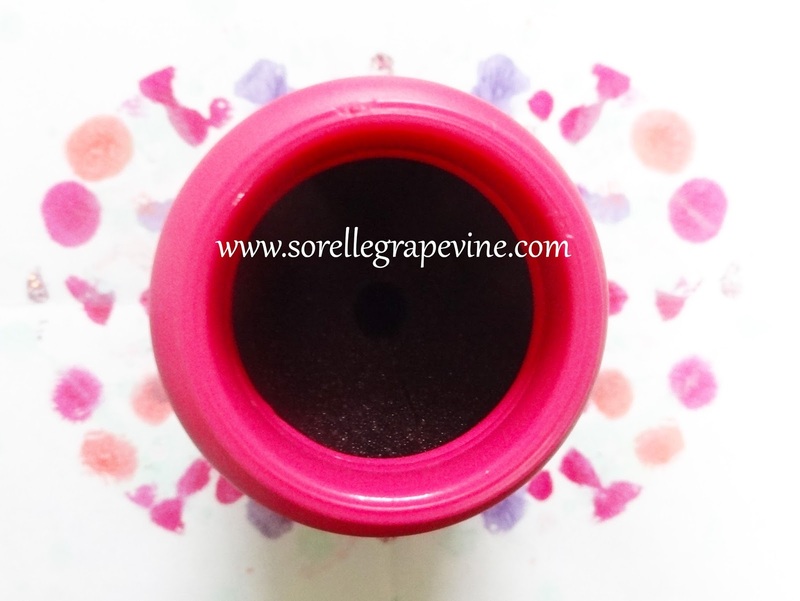 Inside is a black colored sponge which is soaked with the remover. The product has a nice light almost fruity smell to it. The sponge has a hole in the middle in which you need to insert your finger (one at a time) and sort of roll around till the paint comes off. Technically it does not take just a second but is a little quicker in comparison to rubbing with a cotton. The main amount of paint or central body comes out quickly but the edges near your cuticles take time and sometimes you need to do them with something else. 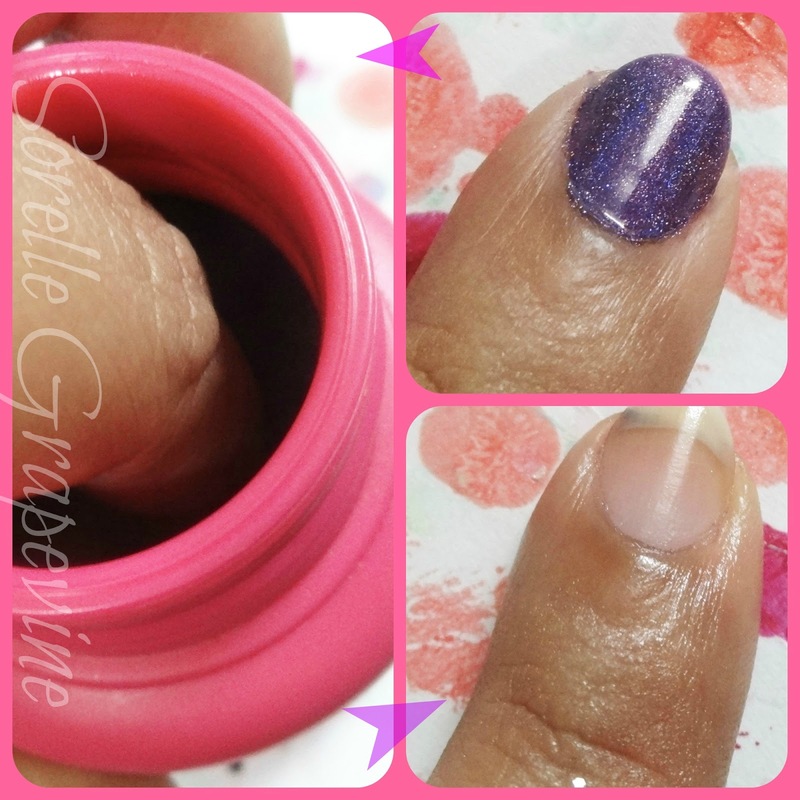 The remover is nice and does not leave your nails feeling dry. Bourjois claims that it contains sweet almond oil for nourishment. So far so good. Would I recommend it to you and say “Oh you must go and get it….like right now!! !” No I would not….at all! Let me tell you my beef with it. Firstly, it did not help me at all in removing my glitter paint ie it took me as much time as doing it with a cotton would have taken. So it does not replace the nail foil method one bit. Secondly, after I did remove my glitter paint on one nail partially I realized that all the glitter particles have gotten lodged inside. Now every time I clean my nails with it they come out carrying glitter. Not to mention how unhygienic this is as each time the product is deposited inside. You cant take the sponge and wash it coz that would mean product down the drain. See the glitter on my finger after I clean my nail. Thirdly, Even for regular removal it is not that much of a help coz the time I saved supposedly goes in trying to get the paint out from the nail corners (Ok I would like to edit here. I found a solution to my problem rather what I was doing wrong. I was just inserting my finger so that the nail is covered ie till the joint below the nail. I found that if you go in deeper ie till the 2nd joint the process is actually quicker and does the corners too). Fourthly, it makes no sense to dish out 800 bucks for an item which does not offer you any working advantages. I mean a pack of cotton and a bottle of remover will cost you like 1/10th of this. Fifthly, UNHYGIENIC! I want to remove my ish and throw it away each time and not rub it on again and again. Imagine storing your used cotton and reusing them each time. Yes that is what you are doing here. 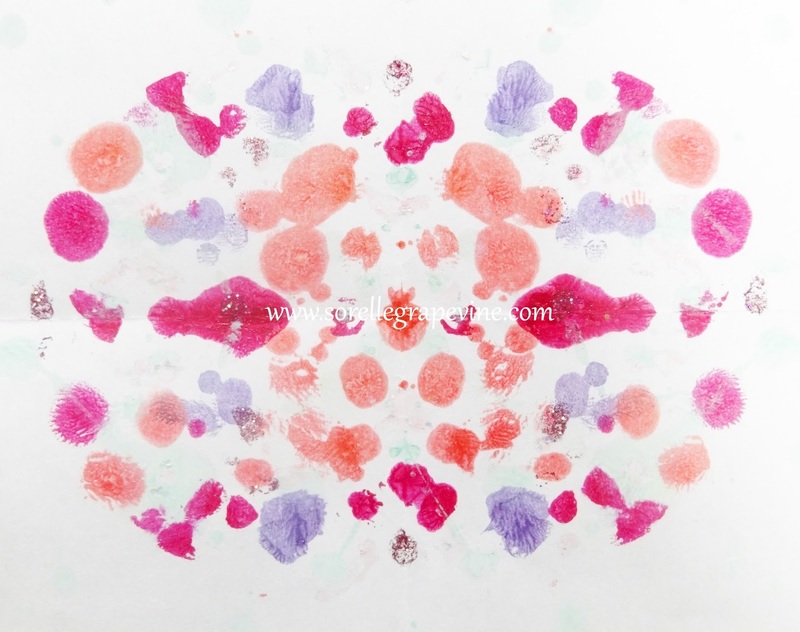 I created a background for the product using nail paints. Kinda looks like those drawings psychiatrists show doesn’t it. I see….fishy! Wait….does that mean I need help?!? I don’t know why some people recommend this. For me it was a complete dud and not worth the price tag one bit. I could have gotten a lippy in that much or maybe even 2. It is all nice and all and does the job…no argument there….but still it is not worth putting your money in (Ok another change of heart. 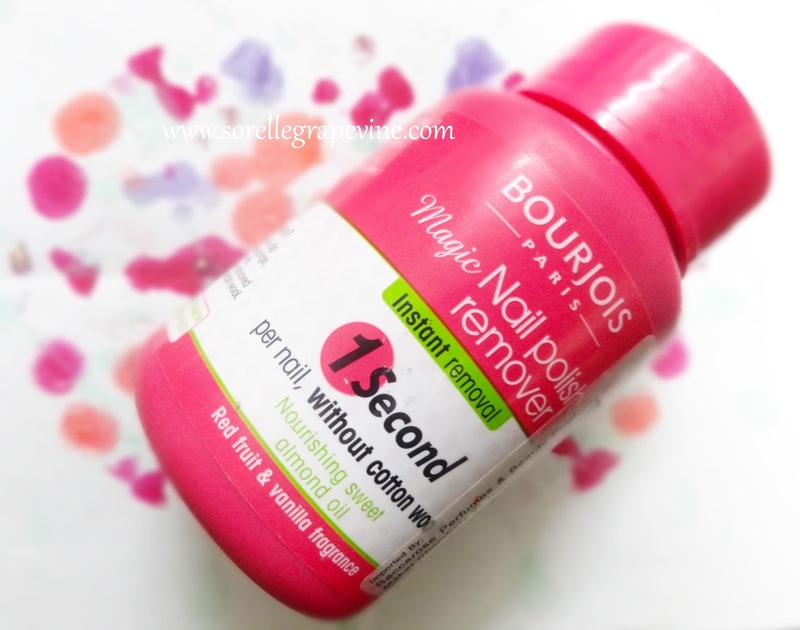 Though I still don’t think it is worth it in its current form but if Bourjois releases a liquid version of it ie one that I can use on a cotton I would totally buy it coz the remover of it is great and quite gentle and moisturizing for the nails). So what do you guys think? Have you tried this product? Or have been wanting to try it? Do you feel that it is worth it and I’m being too judgmental? Do let me know your thoughts and views. I will catch you soon. Bye and Be Safe! 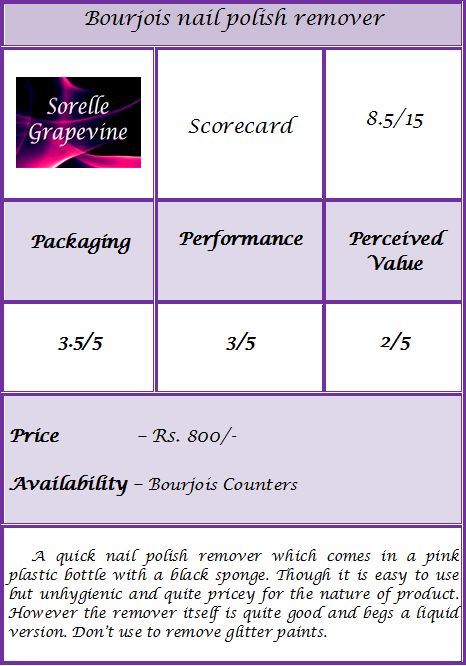 Would you recommend Bourjois Magic Nail Polish Remover to your friend? – Same as above.